We welcome your photos and stories to share with our other customers and friends. Our first photo is of Brad Lawless and the very first original Bubbles seahorse toy. We believe that they are working their magic on each other! Brad loves camels and turtles, his mom and dad, his sister Danielle and his dog Sugar. He is wearing a "Warrior" shirt... "a man noted for his valor and prowess - a champion". 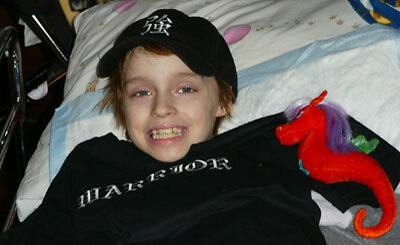 He is a noble warrior that has been battling Ewing's Sarcoma for three years. Brad makes us believe we have the strength to overcome anything in life, and the world is truly full of miracles - including the best one of all- him! He has become involved with a wonderful cause on his journey, through a series of events and stories of his own.